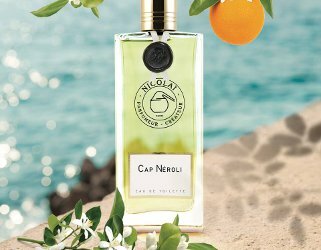 French niche line Parfums de Nicolaï has launched Cap Néroli, a new fragrance. ‘Cap Néroli ‘on the French Riviera’ is a tribute to the bitter-orange cultivation of the Côte d’Azur. I imagined the scent of a point of land running into the sea and having the sweet name of Cap Néroli!’ Patricia de Nicolaï. This Eau de Toilette is a three-act play performed in a natural setting, like an open-air theatre perched on a hill plunging into the Mediterranean. The overture is a ballet of citrus enhanced with rosemary and mint, while a prelude of bitter-orange petitgrain essence heralds the arrival on stage of the majestic Neroli flower. Small in stature but powerful in scent, this radiant bloom is escorted by a bouquet of jasmine, ylang and eau de Brouts which come together in a delicated-paced choreography. Oakmoss, plus a hint of musk and amber, provide a finale like a bottle cast into the sea with an intoxicating message inside. Parfums de Nicolaï Cap Néroli is available in 30 and 100 ml, or in a 15 ml refillable spray with 250 refill. Sounds good! Need to give it a try. I just hope it is not fleeting. I don’t mind if it’s fleeting — it has shot to the top of my want list! It sounds good. Have you tried it? No — just mean that it sounds very appealing to me. I usually like her lighter florals. Oh drat — do report back when the snow clears! Oh that sounds good! I’m a PdN fangirl anyway, but that sounds perfect for summer. This summer. This does sound really nice for summer. I definitely want to try it at some point, especially if I can’t make it to the French Riviera any time soon. Sigh. This is like the Armie Hammer of perfume: Every sunny, pretty note all wrapped up in a beautiful package. I think I NEED THIS. Oh wow! Never enough nerolis, and Nicolai definitely has a way with airy compositions. I’m in. But what’s Eau de Brouts? Wondering the same.Hopefully it doesn’t smell like brussel sprouts ???? Another product of the bitter orange tree, similar to petitgrain. Mmmmm, I’m afraid I’m in grave danger of blind buying this in the 30ml size . . . I will buy this, I know. I would love to have some right now, I’m craving summer somehow. The weather is cold here, but we’ve finally got some sun! The notes sound interesting, I think this will be darker than her last summer eaux, but I’ve loved all of them so far. It’s been some years since I was in the Nicolai shop in London’s Fulham Road, but relatively recently I became aware there’s a second branch quite close to Marble Arch, which is now on my list for annual December trip. I wore Le Temps d’Une Fete, in both its incarnations, a long time ago. Hopefully in December I can catch up with all the output since my last foray. Made a blind buy and had a bit of a shock on first spray. Ashtray smell. Jaiks! Realized later that that was the oakmoss (Chanel Cristalle also smells like ashtray on me…). Wonderfull dry down luckily and I got what I wanted: a neroli “with something extra”. ??????????? ?